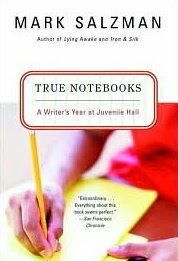 As a member of the Freshman Common Reading panel, which I previously discussed in this post, I agreed to read and review Mark Salzman’s True Notebooks: A Writer’s Year at Juvenile Hall. I have to be honest, True Notebooks is not a book I would have picked up on my own. As far as childhoods go, mine was pretty rough. There were lots of opportunities for me to give-in to my surroundings, to let the environment dictate the type of life that I would live down the line, but for whatever reason, I chose not to go that route. I made a choice. For this reason, I was not excited about True Notebooks. Reading a bunch of essays written by juvenile delinquents that are being tried for murder? Not my cup of tea but I dug in and read a chapter or two and before too long I was hooked. Mark Salzman was writing a book on nuns and was completely stuck. His friend suggested that he visit L.A.’s Central Juvenile Hall because there was a nun there by the name of Sister Janet Harris that ran a writing program for the inmates. Perhaps he could talk to her about her experiences as a nun, and the writing would begin to flow more easily. Mark could also sit in on one of the writing classes he teaches, just to experience the program. Reluctantly, Mark makes the visit. What he finds there, so moves him, that he decides to teach his own writing class and quickly becomes an active part of the Inside Out Writers program, offering classes on Wednesdays and Saturdays to the male inmates of the K/L unit. True Notebooks is a collection of Salzman’s thoughts as he struggles to gain their acceptance. Each chapter includes samples of the writing which is unaltered except for the spelling and punctuation suggestions made by Salzman. For this reason, there is profanity and crude dialogue but as the reader gets to know each boy through his writings, the language used, loses its punch. I learned not to pay too much attention to it. “Deep down inside, this angry person awakens. Another day facing perpetual incarceration behind no mercy walls, as we are inmates. After reading this book, I do feel as if I am more understanding to youths that have been dealt a tough hand. They had choices, but without role models they often made the wrong choice. Even though I did not have strong parental role models growing up, I did have the kindness of strangers that touched me and taught me how to be a good person. Many of these boys did not have that. I’m so glad I decided to read this book and I will be recommending it to the panel come our meeting in January. If you’d like more info on Inside Out Writers click here. Thanks Ti for a great review. I am working on my Friday Finds post , so I just found another book to add to my list. I found your review very moving. Your personal experiences added a lot to it. Thanks for sharing that with us. Fantastic review. Thanks for sharing your personal thoughts. What a powerful book, to pull you in (resisting all the way! ), and to change your opinion about the youth corrections program.Reading in their voices is much stronger than being told in a third person view, isn’t it.I’m glad this worked for you, and that you’ll be recommending it to the panel.